Sam Bradford isn’t happy about the Eagles drafting quarterback Carson Wentz with the second pick in the draft last week. His response has been to demand a trade out of Philadelphia, which doesn’t take kindly to being rejected by one of their own. Their response? Well since they can’t boo him right now because the NFL isn’t in season, they do a very Philadelphia thing: create a sandwich to commemorate Bradford’s trade demands. 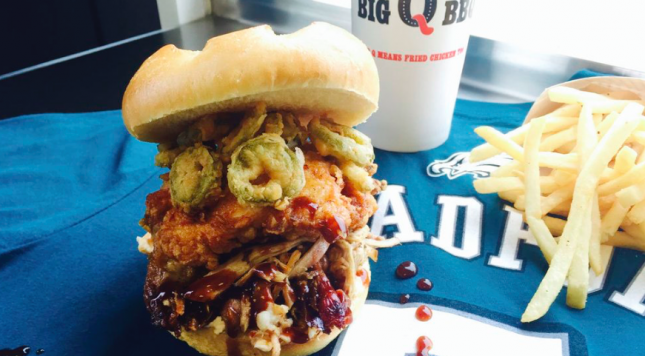 Starting at noon Wednesday, Big Q BBQ will be giving away 150 Sam Bradford sandwiches. After that, he will offer it for $5 until he’s traded. The sandwich will eventually sell for $7 (Bradford’s number). Abruzzese said all of the ingredients represent his feelings about Bradford. The deep fried jalapenos symbolize the fact that he’s on the hot seat. The pulled pork represents the fact that it’s inevitable that he’s going to get pulled. The spicy Philadelphia cream cheese spread is a nod to Philly. The potato roll symbolizes the fact that he often goes down like a sack of potatoes. “As a lifelong Eagles fan, there’s no need to explain why I included fried chicken,” he added. Bradford joins former head coach Chip Kelly in Eagles lore as having sandwiches crafted for them in response to crossroad moments in their lives. Will there ever be an Eagle to have food named after them for … winning a game?